Kowa enjoys a spectacular reputation of enduring quality internationally, where there are large numbers of nature enthusiasts. 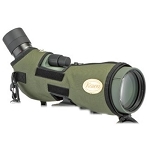 Their TSN-82SV Spotting Scope is the modern iteration of Kowa's TSN-821M scope, which endured for well over a decade as their premium design. 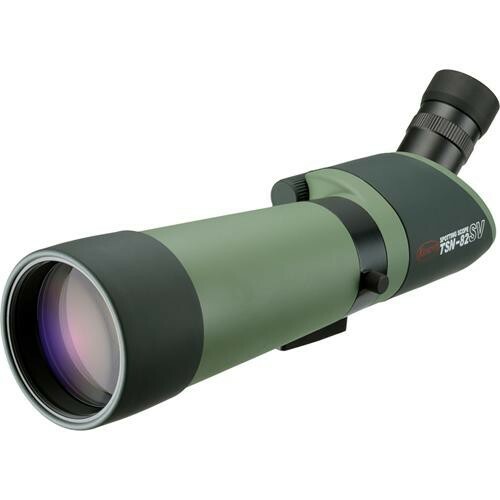 The 82SV's a great choice if you want the very best in optics from a respected Japanese company without forking over an arm and a leg to get it. The TSN-82SV was created using advanced optical technology and the best of materials known. Its 82mm objective lens gathers gobs of light, ensuring a bright field of view in nearly any practical nature viewing. It makes for a great casual-use astronomical scope. The 82SV is offered exclusively as an angled viewing design. While it isn't a matter entirely settled until you experience the differences for yourself, it is nearly a universal belief that the angled scopes offer a more comfortable time of longer glassing, and are unequivocally easier to share amongst a group of observers. You can also get away with a shorter tripod using the angled scope, perhaps shaving precious ounces off your pack weight. Angled scopes do require a bit more experience at locating the subject; if you're tall and equipped with a tall tripod and primarily viewing alone, a straight viewing scope is often preferred. The snow has melted and the sun is out. This is a follow up to the review from another post asking about spotters for F class. I have now spent a few days shooting with the KOWA TSN82SV w/ LER25X at 600m and "1000yds". For me, the main goal of my optics is to see the air NOT the bullet holes. F class targets are scored and there is that big orange disk showing the result. The spotter is to help me increase my field of view and show me as much detail as possible about the mirage and/or flags. Show me that detail as quickly as possible and for as long as possible. So how do I feel about the 82SV? Very happy..... When there is no mirage as in winter dry cold air, the optical clarity with this eyepiece is stunning and I was able to see incredible details further then I have been successful at before. BUT, this glass does pick up mirage very quickly and that degrades clarity of distant objects. The field of view is really nice and wide and there is real sense of depth in the image. Colour is neutral and contrast is comfy. Subtle details of the mirage are more prominent then in my Sightron 10-50 scope. It is simply easier to see mirage and to get a better feel for its changes. As an aid to seeing the air, it is working very well. BUT because it sees mirage well, it will fuzz out objects quickly so this is not your spotter if you want to glass and resolve objects at distance in a mirage day. If hunting, you will see very far... if there is little mirage. Eyepiece works well. Eye position it not too critical. Eye relief is very comfy and I wear glasses. Ergonomics and adjustment are very convenient and easy to use in position. My other experience was with the KOWA-663. I do not have them to compare side by side. From memory, the image quality of the 663 is better. you can see the mirage AND the target clearer. The objects don't fuzz out as much. It is also smaller and more compact. Costs more but you will get more. For a sub $1k (some sale prices are really good on this unit) spotter WITH superb eyepiece, the TSN82SV gets my nod. 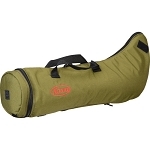 If you can spend more, KOWA 663 (around $1260). If you have way too much money, Leica Trinovid. I will try and compare to the Pentax 80ED's at upcoming matches. Very similar in size to the 82SV and similar costs to the 663. I know the Pentax offers very nice image quality and their eye pieces have long eye relief. Season is ramping up. Hope this helps you with choosing a suitable spotter.